Loïc’s friend Adrien is gone, kidnapped by the Impressionists, bizarre men made of paint who roam the Parisian catacombs. 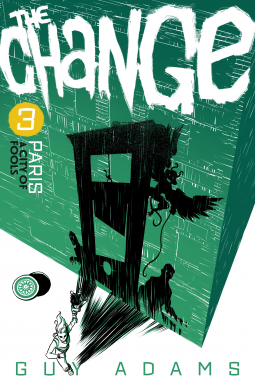 Now, if Loïc wants to see Adrien again, he must travel to the Louvre and bring him back from the lair of the strange – and deadly – Impressionists. I received a copy of this book from Solaris Books in exchange for an honest review. This is book 3 of The Change series; like the previous two books, they are set in different locations and with different characters. This book is told from Loic’s perspective and we learn how he met Adrien during one of his runs searching for food. Loic returns from one of his latest food runs after a run in with a rhino affected by The Change, and hears that the tunnels where they live was attacked and some children have been kidnapped. Loic learns that Adrien has been kidnapped after trying to lead the kidnappers away from the other young children that the Impressionists were trying to take with them. We follow Loic on his journey to rescue Adrien and the other characters he bumps into that will end up helping them along their journey. Overall I really enjoyed this novel and finished it in a few hours. The Paris novel concluded its own mini story within the novel, so I didn’t feel left hanging for the continuation of the Paris novel. I would still be interested in seeing how the rest of the series goes and how the events of what caused the change would be explained.